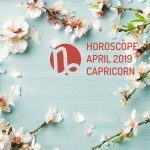 Here is your Capricorn Horoscope for April 2019. Every month, you will find at WeMystic the astrological forecasts for your zodiac sign. During April 2019, several celestial bodies will be passing over House IV of Capricorn (home, family, roots), the site where Chiron (the wounded healer) is currently located. In the first instance, the entry of the asteroid Vesta into House IV of the sign of Capricorn (03/04), speaks of the connection with the inner home, and the healing of family ties (which also affects Chiron). Next, on April 5th, the New Moon will take place in Aries which will touch the aforementioned location (House IV of Capricorn), suggesting a move, family reconciliation, or structural changes of the dwelling. Finally, the passage of Mercury (17/04) and Venus (20/04) on House IV of Capricorn, warns about the importance of analyzing the options available, before making a decision (not choosing the first thing that appears), and never leave aside the desires of the soul, because it is what will provide joy. Another aspect to keep in mind, in April 2019, is the entry of the Sun in House V of Capricorn, which suggests the possibility of establishing a romantic relationship, which will transcend the casual and momentary. For Capricorn’s couples, April 2019 is projected as a quiet period, despite the beginning of the retrogradation of Pluto and Saturn (on 24 and 29/04, respectively), in the sign of the goat. Juno’s entry into House VII of Capricorn (20/04) announces the formalization of constituted couples (commitments, marriages, living together); while the presence of Eros in House VIII of the sign, constitutes an invitation to explore sensual pleasures with the companion and to enjoy intimacy. On the other hand, Mars continues in House VI of this sign, pointing to a high level of productivity on the work plane. However, this planetary position also alludes to the factor of competition with colleagues, teammates, subordinates and even with yourself, which can provoke episodes of stress and anxiety. These aspects add up to the retrogradation of Pallas in Capricorn’s House X, something that is capable of disorienting the subject about what he wants to achieve professionally in the present and in the long term, placing his real aspirations second because of a question of status, acceptance, satisfying the expectations of others, or avoiding the collapse of obsolete structures. Fortunately, the Double Full Moon in Libra on April 19 will touch Capricorn’s House X, highlighting the importance of rethinking your career goals, and building your personal definition of success, without the weight of old beliefs and the interests of others. The passage of Mercury and Venus over House III of Capricorn, during the first fortnight of April 2019, indicates that it is essential to focus your attention on the present, without this implying losing sight of what you wish to achieve in the future (Neptune also in House III). In this sense, it will be favorable for you to participate in workshops and short courses, seminars, and lectures, which contribute to updating your knowledge and acquiring new skills. Likewise, sessions with therapists, psychologists, life coaches, and business advisors will be especially productive, when you merit to observe the circumstances from a fresh perspective, and to analyze your options with objectivity. Keep in mind that on April 20, the Sun will enter the House V of Capricorn, referring to the use of creative potential, and the development of new and exciting personal and professional projects. In general, the finances of Capricorn’s sons and daughters will maintain a stable trend, during April 2019, although the presence of the asteroid Psyche (or Psyche) in House II of the sign, indicates that the subject can try to compensate emotional deficiencies with the acquisition of material objects, or rebelling unnecessarily against the circumstances (Lilith in House II). For the natives of Capricorn, the presence of Mars in the House VI sign, suggests an increase in physical vitality, and the level of competitiveness applied to physical and professional activities. On the other hand, the retrogradation of Jupiter in House XII of Capricorn, from April 10, refers to a marked tendency to social isolation, and alteration of sleep patterns. From a positive perspective, retrograde Jupiter is interpreted as inner expansion, by affecting House XII of the sign of the goat (the realm of the mystical and the unconscious), favors spiritual pursuits, the practice of meditation and prayer. We must not forget that, in April 2019, the retrogradations of Pluto (24/04) and Saturn (29/04) will take place in Capricorn, sign where it is also found in South Node (representation of the challenges to be overcome in present existence). The beginning of the apparent regression phase of Pluto and Saturn refers us to the encounter with true personal power, and the identification of obsolete structures, which were once profitable, but are now insufficient. The confrontation with old schemes can be shocking for Capricorn’s sons and daughters, but the more they cling to the old, under the pretext of tradition or convenience, the more arduous the process of detachment will be. Keep in mind that Lilith and asteroid Psyche are in House II of Capricorn, so sensitivity and the desire to rebel against the established will be at the surface, especially in situations involving self-esteem and past traumas.